30 teachers participated in fire handling training held by cooperation between West Jakarta Fire Handling and Rescue (Gulkarmat) Sub-dept. and Pusat Kompetensi Pengembangan Pendidik, Tenaga Pendidik dan Kejuruan (P2PTK2), Thursday (3/15).
" 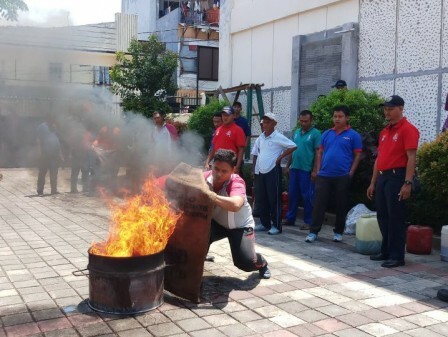 In this training, participants are taught to extinguish fire using wet sacks and fire extinguisher (APAR)"
This training was held in Jakarta Disdik's P2PTK2 office, Krukut, Taman Sari. West Jakarta P2PTK2 Head, Endang Wahyu appreciates Gulkarmat Sub-dept. 's fast response in following up fire handling training request. "This training is important to anticipate fire that may occurs around this office," he stated. Sector IV Taman Sari Platoon Commander, Supriyono said, this training wa s done to train the participants in preventing and extinguishing fire before it becomes large. "In this training, participants are taught to extinguish fire using wet sacks and fire extinguisher (APAR)," he informed.